Upon remodeling our house, my wife and I decided to paint our dining room with a suede effect. 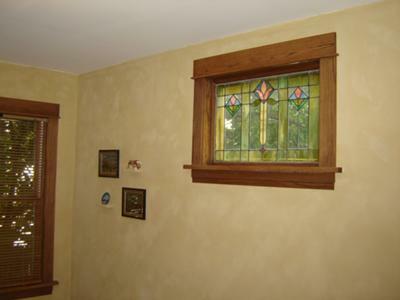 We have an art glass window original to the house, and we drew from the yellowish hue of the glass for the color. Before the remodel, we had plain yellow walls in the dining room to complement the art glass window, but we found that to be somewhat boring. We painted every room in our house (walls and ceiling), but this was our first attempt at "faux" painting. After taping off the trim (baseboards, doors and windows), applying the first coat was just like any other paint job, with edging and rolling. To make the suede effect, we used 3" brushes with very short bristles (they cost less than a dollar each). Making the random "X" patterns was initially tricky, trying to avoid making a pattern. After a while, though, being random became easier. We took care to make sure we applied the technique up to the edges of the trim and the ceiling. The room is rather small (9' x 13'), but the faux suede finish really gives depth and character to the walls.